The red grapes are handpicked between the end of September and the beginning of October and are quickly transported to the winery where they are sorted in order to remove any underdeveloped or damaged grapes. The grapes are separated from their stems and release their juice as they burst. The juice and solid matter, such as the grape skins and seeds, are transferred to vats where they will macerate. This step helps the sugars contained in the grapes to be transformed into alcohol, carbon dioxide and heat, with naturally occurring or selected yeasts bringing out the aromas and flavours. During maceration, pumping over of the must and punching of the cap – a homogenous mixture of made up of solid particles (pomace) and must (grape juice) – must be performed several times. This encourages fermentation and the extraction of tannins while lending colour and flavour to the wine. Temperatures are monitored during this phase, which lasts 15 to 20 days. When maceration is complete, the wine obtained (clear juice) is drained out of the vat using gravity. This free-run wine is then transferred to another vat or to barrels. The pomace is reserved and is pressed to yield the tannin-rich press wine. 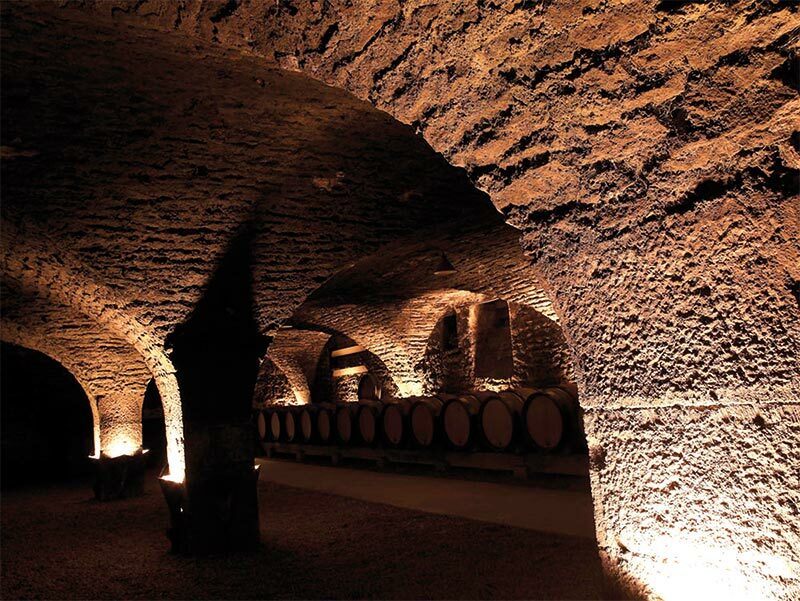 Freed of the must’s deposits, the press wine is combined with the free-run wine in barrels where it undergoes malolactic fermentation in order to bring down the wine’s acidity by transforming the malic acid into lactic acid. The wine is aged between 6 and 18 months. 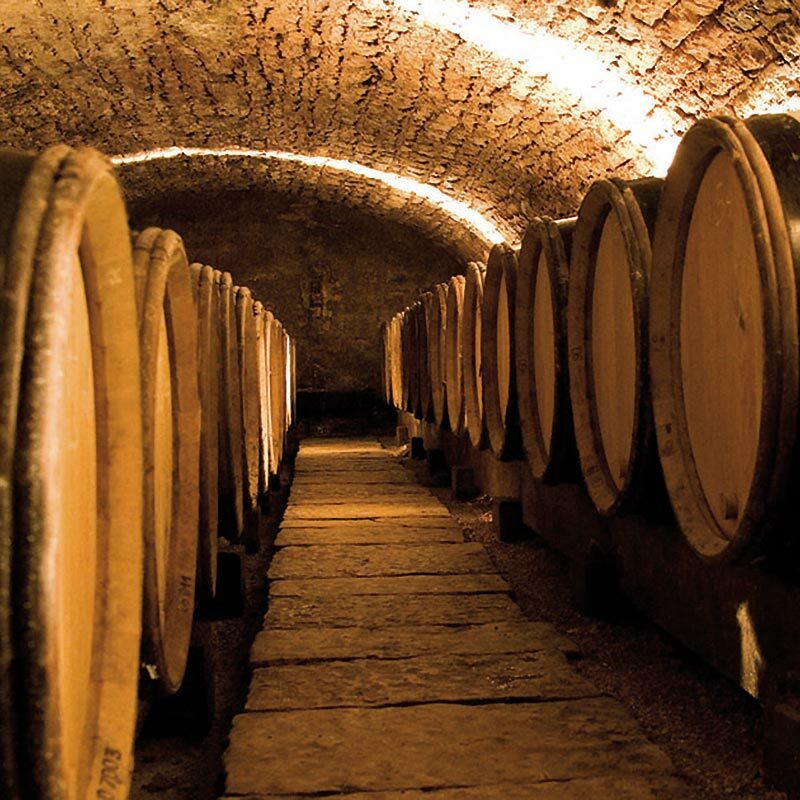 The wine is “racked”, or transferred to another container, in order to eliminate the Co2 produced during malolactic fermentation and to separate the clear wine from the lees. Then each barrel is topped up with the same wine as needed to compensate for any losses due to evaporation. The wine is filtered so that it is clear and brilliant before being bottled using a filler and corker. The white grapes are handpicked at the end of September – beginning of October and are quickly transported to the winery where they are sorted (we remove any underdeveloped or damaged grapes) and destemmed. The grapes are pressed gently to extract the juice or “must” in a receptacle called a “maie” from which it is pumped into a decantation tank. The juice collected is cloudy and is left to settle at a temperature of approximately 12°C for 12 to 24 hours so that the heavier particles (debris from the skins) fall to the bottom. The clarified juice is then transferred to fermentation tanks. This step helps the sugars contained in the grapes to be transformed into alcohol, carbon dioxide, and numerous other components that help bring out the wine’s aromas and flavours using naturally occurring or selected yeasts. 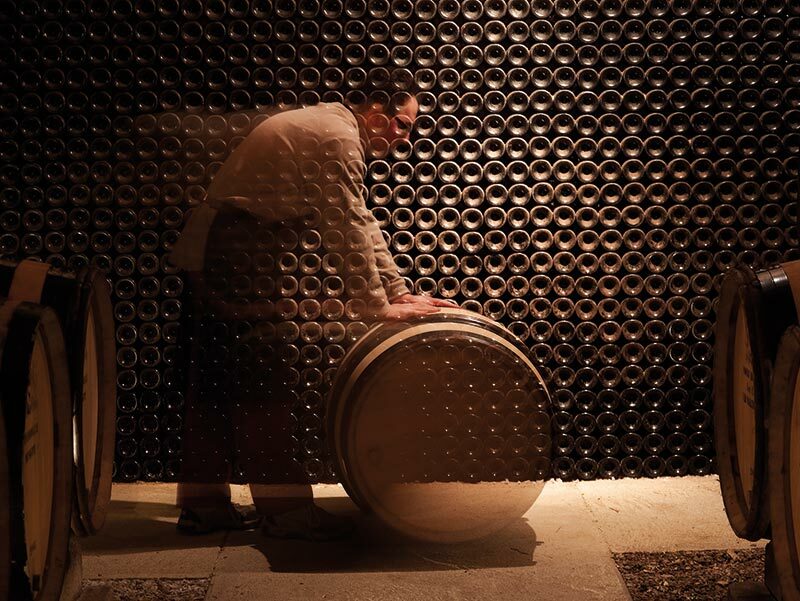 This may take place in tanks whose temperature is maintained at 18°C or in casks depending on the wine to be produced. 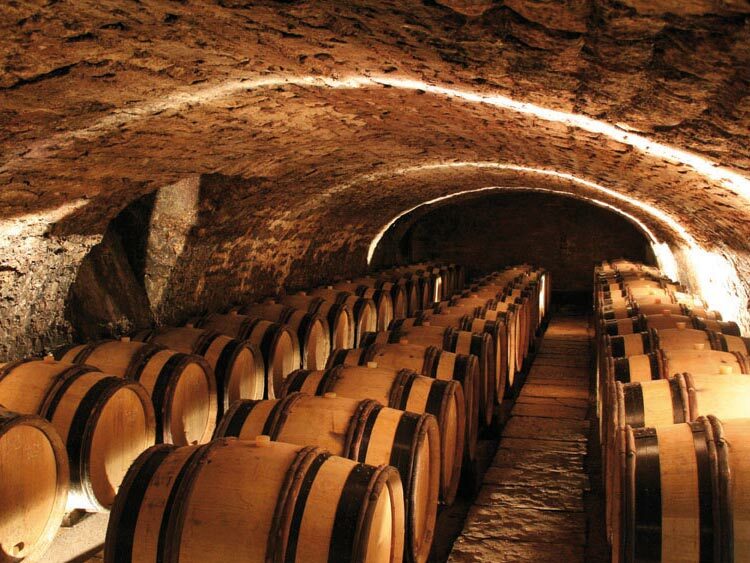 Malolactic fermentation reduces the wines’ acidity by transforming malic acid into lactic acid. Ageing may last between 6 and 18 months. Then the wine is topped up – each barrel has some of the same wine added to it as needed to compensate for losses due to evaporation. 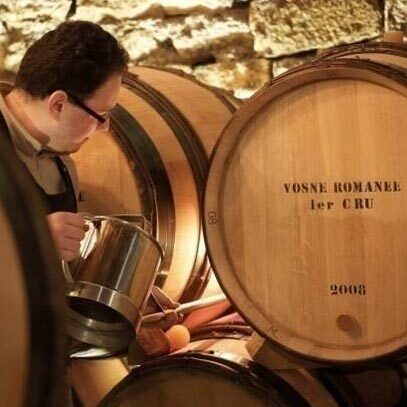 This consists of stirring the wines’ fine lees, which are deposited at the bottom of the barrels during the ageing process, back into the wine. This protects the wine from oxidation, as well as enhancing its roundness and adding rich flavour and mouthfeel. The wine is “racked”, or transferred to another container, in order to eliminate the CO2 produced during malolactic fermentation and to separate the clear wine from the lees. The wine is gently filtered so that it is clear and brilliant in aspect before being bottled. A variety of suppliers of barrels made with wood sourced from different areas adapted for the various terroirs and vintages. Aged in French oak for 6 to 18 months depending on the appellation (15% to 40% new oak).